Paige Dolecki - Stampologist: Happy Valentine's Day! I hope you all are having a wonderful Valentine's Day filled with sweetness, fun and love! 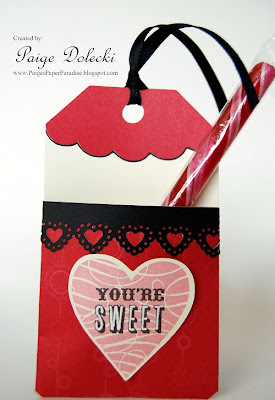 Here is a little treat holder tag I made for my kids using the Art Philosophy cartridge and an older Martha Stewart border punch. They're each getting a small box of chocolates too. Daddy got the BIG box of chocolates because his has to share with me - LOL.